We had just had a rather excellent pizza. That in itself is the exception and not the rule here since most pizzas will get it close, but not right. Add to that that I have almost always gotten what they call "Counter Pies" and individual slices. That means they made the pie, then slice off a slab and re-heat it before serving. It gives a crispier crust, and that is what I expect. If the crust won't stand on its own and droops when you go to eat it, it wasn't right. We had discussed the ongoing things in town, our own lives, and the rest of whatever came to mind, and waddled out of the place. I had three slices that would serve as a meal and a half later when needed. Chatting our way East, or North depending on your point of view, on Wilton Drive, I was stopped, abruptly. At what, there's a lot to look at. That one over there, it's different. It's GREEN! I could hear the stressing of the color in capitals in his voice. Kevin isn't prone to doing that. I hope it isn't another damn iguana. I saw it, not so much for what it may or may not have been, but for the studies of color that it presented. Green Lizards here seem to be either Iguanas, or Carolina Anole Lizards. The Carolinas are much more rare. The Iguanas are an invasive pest that turn my plants into a salad and give nothing back. These Carolinas were more common until the Browns or Cuban Browns moved in and pushed them up into the trees. 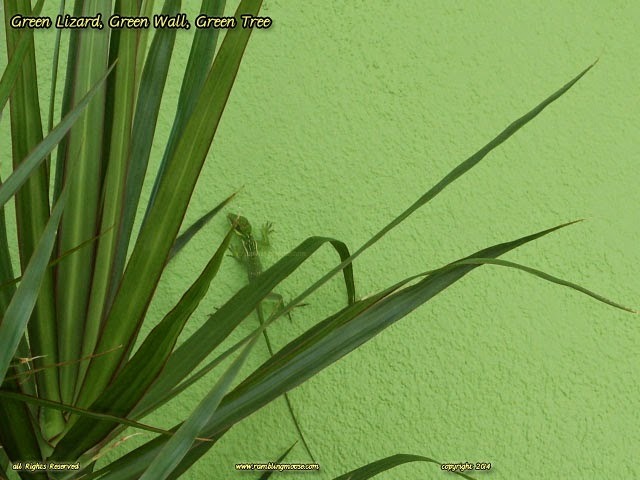 They are so rare that when I see a green lizard, I stop and take notice since they seem out of place. Here was this critter, holding onto the wall around 5 feet above the ground, in clear view of The Drive. I guess that The Gables have created a micro climate for this comparative rarity to do well enough that it felt the need to go exploring on the busier side of the building, right behind the screw palm. Knowing that I had my camera with me, Kevin pointed it out. Once I stopped being confused, I started taking pictures. The little creature kept me in view the entire time and watched to make sure I didn't get too close. Having a proper optical zoom is important, you can stand 10 feet away and zoom in tight. Thankfully the Automatic Focus on the camera didn't foul up all the shots. As much as I like Screw Palms, I would prefer not to have a collection of a dozen or so perfect pictures of a plant with a fuzzy lizard out of focus in the back. Even after living here for 8 years, I am still amused by the lizards here. I never saw them in South Jersey, and while some people around me insisted that we could find newts and salamanders around, you couldn't prove it by me. Now, I go out into the yard and have to be careful or else I may step on a lizard. Discovering one on my ceilings is a monthly event. Best way to deal with that is "Catch and Release" and let the little thing go do what it's supposed to - collect insects that may try to get in my house. After all, this isn't a big city apartment. In some places people will get lizards, typically geckos, and simply let them roam free in their house. If that house is an apartment building, it's an effective way to get rid of roaches. Just leave a little water out and they'll do fine. Since we don't have roaches, but merely the occasional termite, moth, or black racer snake, we tend to relocate lizards outside and we do so gently. After all, I'm entertained so I may as well treat them right.